BMW rolled the electric car movement further into the mainstream in 2014 by introducing two new electric cars: the i3 and the i8. The former is a three-door hatchback coupe, while the i8 is a sporty two-door boasting 357 horsepower. To further cement their commitment to creating eco-friendly transportation, BMW also developed a charger for their new e-cars that uses completely off-grid power. 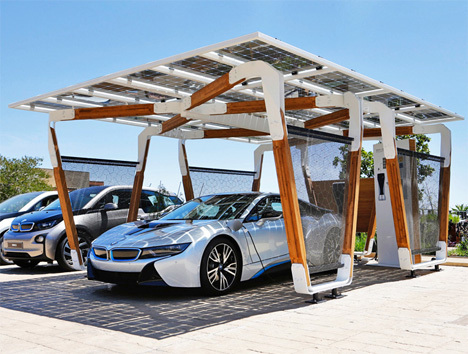 The i Solar Carport is made of sustainable, fast-growing bamboo and topped with efficient glass solar panels. 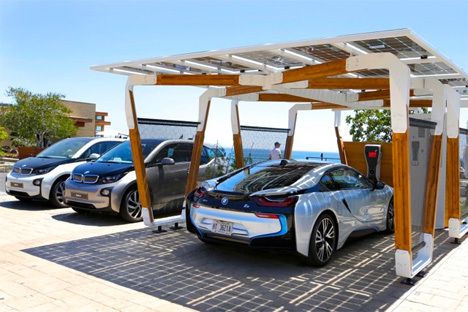 The panels collect solar energy and send it directly to the EVs via BMW’s i Wallbox Pro, a charging module mounted directly to the carport. The readout on the Wallbox indicates just how much energy is being generated. After your car is charged, any excess solar energy can be directed to your home, actually saving money on your home electricity costs. 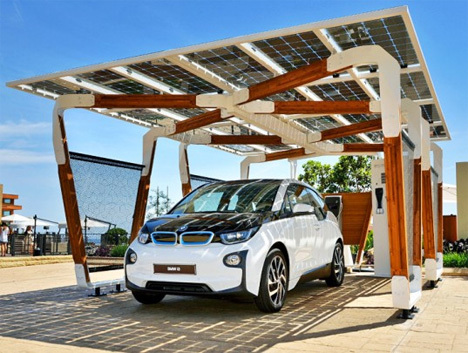 Pricing information isn’t readily available; the BMW website directs consumers to speak with dealers about purchasing their own i Solar Carport. Given its high quality materials and the high-end BMW brand, we expect it won’t be cheap. But if you’re going to throw down $41,000 (the i3) to $135,000 (the i8) on an electric BMW, you might as well go a little further to get a personal charging station that can power your home as well as your car. See more in Cars & Trucks or under Transportation. October, 2014.